On the surface, the wool market appears to be meandering along at a comfortable level, especially if you’re the seller. Buyers, on the other hand, are acting with caution in accepting orders for future delivery. Another large clearance relative to the last 8 months was evident, with prices pretty much unchanged. However, looking ahead, the consensus is that the challenge of supply falling below normal expectation into the winter is rapidly approaching. The Eastern Market Indicator (EMI) increased 4 cents on the week, ending at 1,927 cents. The Au$ compared to the last week was slightly weaker at 0.712 US cents. That put the EMI in US$ terms at 1,373 cents, a small drop of just 3 cents (Table 1). The market in the West wasn’t able to sustain its level, that’s despite nearly 1,000 bales fewer hitting the market compared to last week. The Western Market Indicator (WMI) fell over the week to end at 2,092 cents, down 13 cents on last weeks close and all MPG’s lower. Supply was down on previous sales, with 41,757 bales on offer. Growers passed in 9.6% of bales offered, resulting in a clearance to the trade of 37,749 bales. The season to date has seen 908,332 bales offered which is 177,718 bales few than the same period in the 17/18 season. The dollar value for the week was $78.1 million, for a combined value of $1.82 billion so far this season. 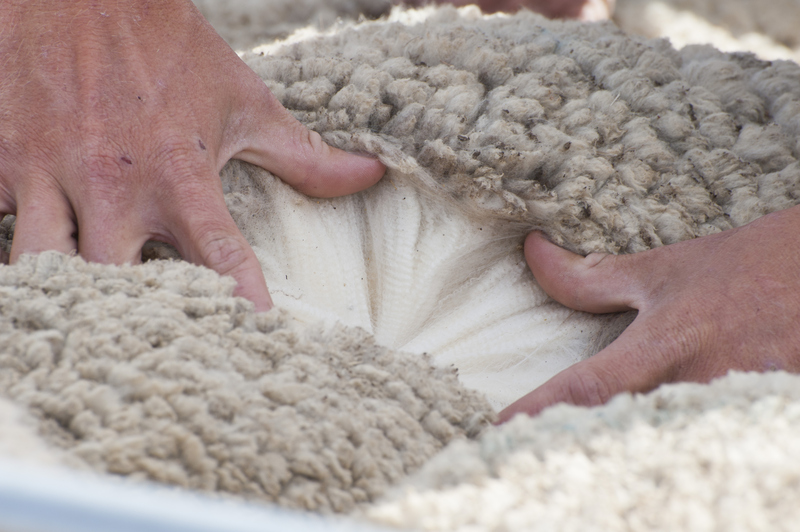 We continue to see a divergence of demand for good quality wool with good measurements, compared to wool that has poorer measurements, generally as a result of the drought. 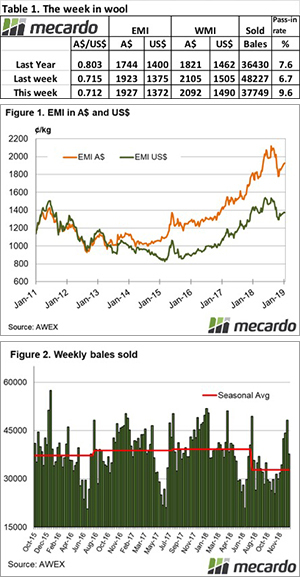 Wool that was presented with low staple strength and high mid breaks again struggled to find buyer support this week. On the other hand, wool exhibiting high quality, high staple strength and low mid breaks were keenly sought. Crossbreds gave up some the gains that were recognised over the last couple of weeks. 26MPG wool was the most affected, losing 35 to 40 cents while demand for 30-32 MPG saw increases. The cardings indicator fell 15 to 45 cents across eastern and western markets. Next week the offering is due to be lower again, with 40,629 bales rostered across the three selling centres. The trend is set to continue for week 32 with 37,575 bales rostered, and 38,242 the following week.